The organization crusades of 2013 are up and running and I have a little update to share today. So far, we have conquered our kitchen junk drawer and I have been getting my craft supplies in order and today I have begun work on our home office space. Now, let me stop there for a minute - a small house = no home office space - so when I say home office, for us that means a little desk in the kitchen and a few small spaces that we designate for certain things (most of which we are creating now). So because of limited space we have to get kind of creative as to how we organize and manage some things. I honestly haven't really spent much time thinking about this until now - so its a work in progress for me. First thing I had to do was just get everything out and then come up with a sorting system to get it all in order. I used some extra storage bins I have to use as sorting stations for all the the paperwork, bills, etc that we had shoved in the desk. I also had a bag for trash (which there was a lot of). I also sorted out all of the little knick knacky things and instead of waiting until later to worry about it I immediately began to put away everything that didn't belong in the desk to its rightful spot. 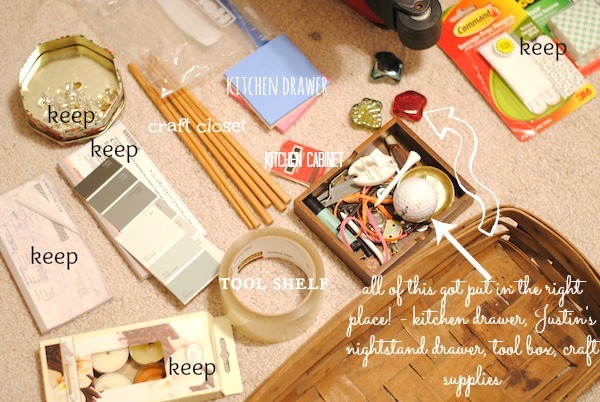 This is so essential in getting organized...make it a no procrastinating zone while you are working. Just so you can see that I did have a spot for everything - here ya go. 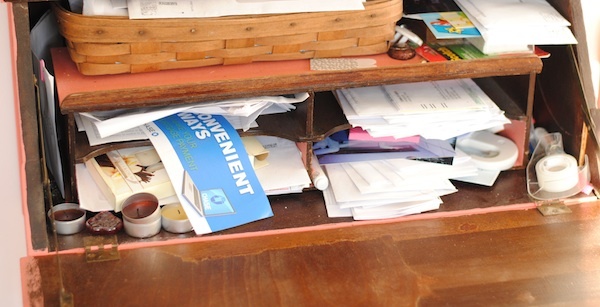 The "keep" things are going back into the desk and everything else went to its correct location. Ok, back to the paperwork. Since we don't really have a home office room or very much space I wanted to keep our filing system simple, easy and functional. Since this is all new territory for us, just getting something in place like this is huge - maybe it will develop into a great system down the road but I'm ok with this for now. So I found these pretty files at Target and a pretty magazine file at Office Max and started there. After I had sorted through all of the paperwork I gave each paper pile a file folder and label - making sure to file away in date order - woohoo for organization! All of these file folders are filled with items that we might need easy access to and also will need to be quickly filed away. 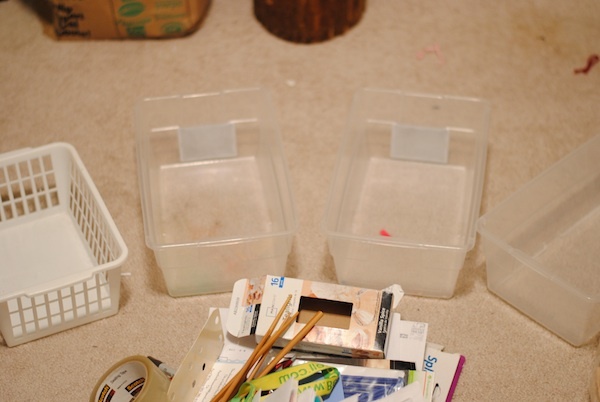 Oh, I used some washi tape for the labels, a cute little trick that Jen from I heart Organizing shared on her blog. I love that it makes it pretty (i'm all about that) and the washi tape is easily removable so if you need to change out a file its easy to do. Ok, so not the most exciting project, but a long overdue one. The feeling you get from de-cluttering and organizing really is so great - and the fact that you can make it pretty and fun is just an added bonus. This job was a little more time consuming than our junk drawer but well worth it - honestly it was one of those, I wish I had done this a long time ago things. I have more organizing to do in our desk and office areas so I will share them soon! Happy Organizing!! I would sure appreciate a visit and I look forward to getting to know you through your blogging. Hey Leslie! Thanks so much for stopping by and following :). I totally struggle with this too - this is totally a new goal for me and I'm learning as I go! Heading over to check out your blog and follow back! I love that magazine stand - it took me forever to find one I liked haha! where is a pic of the organized desk? haha. haha, its coming!! I'm still working on it!!! This is a slow process for me! I'm sure Justin would love to help with the cards haha! He used to take all of his cards out a few times a year and re-organize them...he has several "systems" lol! Looks great. 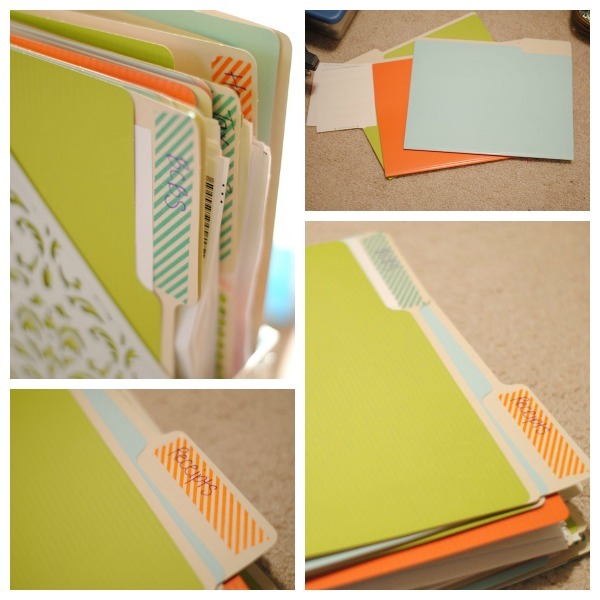 I love the file folder holder. It looks wonderful. 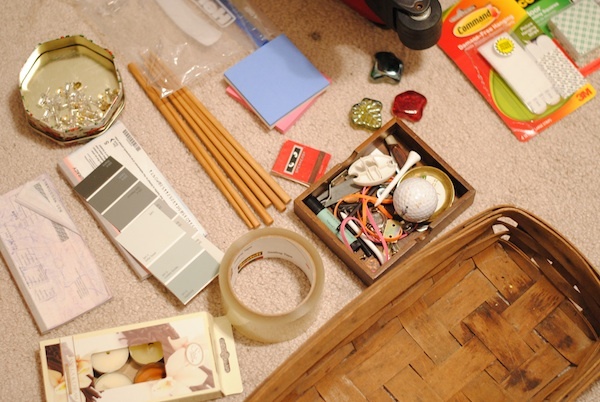 I"m organizing like crazy right now...can't seem to stop myself! Thanks Debbie!! I can't stop organizing either - I have definitely caught the bug :)! Thanks for stopping by! I love that flowery cut file holder!! How pretty! Thanks so much!! Thanks for following as well- heading over to follow back :)! Your blog is adorable. I think I'm going to love seeing your posts every week. Found you from the Aloha Blog Hop! You are so sweet Abbey, thank you! Heading over to follow back!! 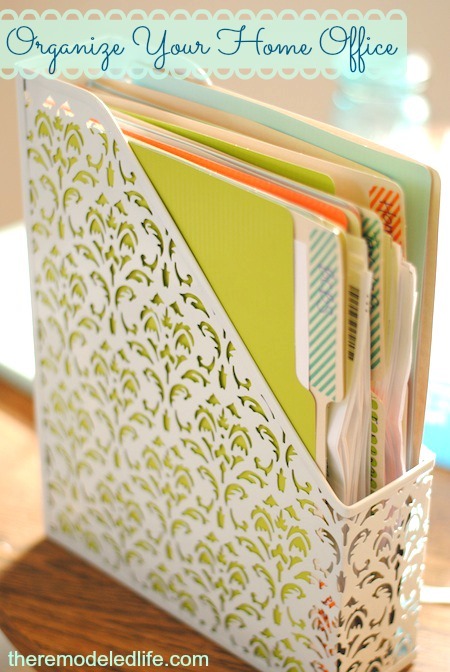 I love the pretty file holder! Can you tell me where you found it? Hey! I found it at Office Max. I couldn't find it online or I would give you a link. Hope that helps! 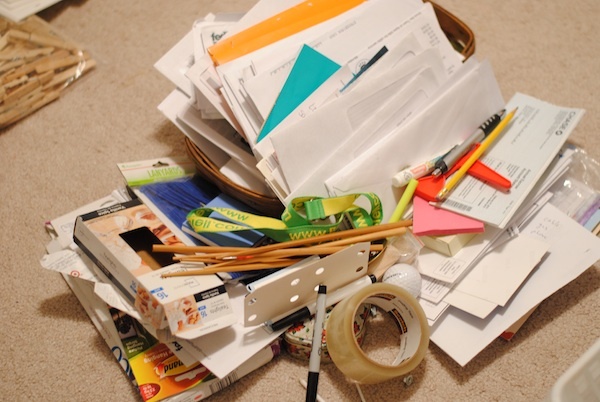 Seems like everyone has a junk drawer. 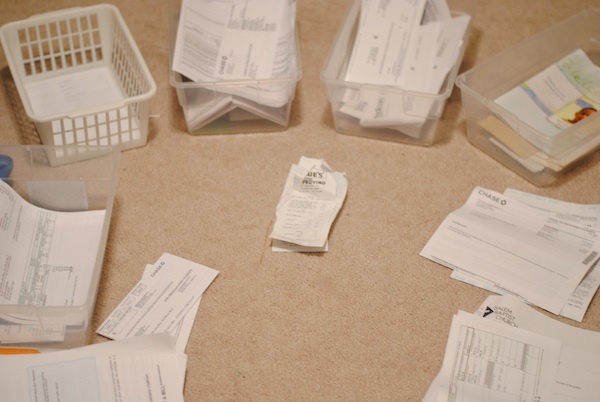 Isn't it nice to get things organized tho...brings a sense of peace. That magazine holder is beautiful...such an elegant touch. A new follower from the Aloha Friday Blog Hop. Would luv if you could drop by my blog as well. 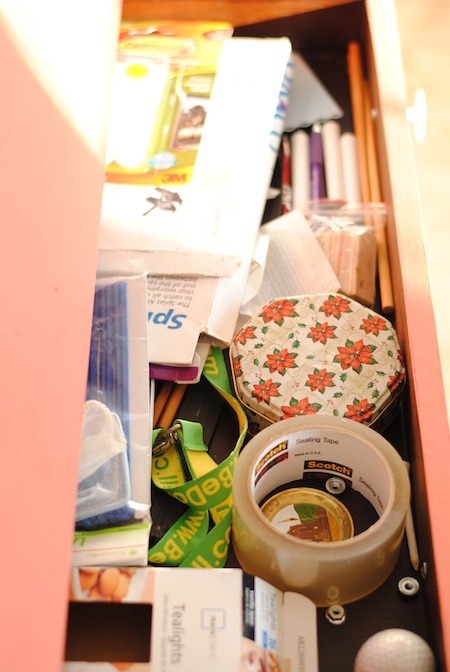 I think every drawer is a junk drawer in our house!! I can't tell you how awesome it has been to get them all cleaned out and organized - I.love.it. Thanks for following along! Heading over to follow back! Thanks for following Krysti! Heading over to follow back!